There's been a whole host of artists over the years whose critical acknowledgement has fare outshone there actual talent. Conversely, there's been plenty of acts who have received scant rewards for their undoubted ability. Jimmy Donley falls firmly in the second category. A talented performer and songwriter, he sits on the swamp pop side of rock 'n' roll, and his page here in the Rockabilly Hall of Fame is long overdue. Born James Kenneth Donley on 17th August 1929, he was raised in Jonestown, Mississippi, close to Gulfport. His upbringing was a mixed affair very much in the Elvis mould. Whilst his mother Myrthe lavishing attention on him and encouraging his musical escapades, his father, Tag, played the Vernon Presley role, given him the "I ain't never seen a singer worth a damn" speech. At age 14 Tag forced Jimmy to leave school, not to become a truck driver but to work in the Gulfport docks, unloading the banana boats. It was hard physical work for a young teenager, but through it all Jimmy kept his music hopes alive. By now an accomplished musician, he spent his spare time playing and forming a strong bond with Myrtle and his baby sister Myrna. His world turned upside down in 1948 when he was called into the Army. A spell abroad left him depressed, longing for the comfort of home and the loving arms of his mother. He turned to drugs for solace and was starting to show the early signs of schizophrenia, leading to an undesirable discharge in 1949. He went through a crazy period of marriages, beatings and divorces, with no less than four wives in four years. Just the thought of the money wasted on wedding rings must have been enough to depress him. The early 50's saw him continue to play and write songs, always confident that he would get the lucky break that would change his families fortunes forever. That big break finally looked like it was here when Mississippi promoters Pee Wee Maddux, Frank "Yankee" Barhonevich and Marion "Prof" Carpenter brought him to the attention of Decca head honcho Owen Bradley. The first session was arranged for 26th February 1957 at Bradley's studio in Nashville. With a cracker band of the city's most celebrated musicians, the session was a blast. The first Decca single was taken from the session with Come Along chosen as the a-side over Kickin' My Hound Around. Come Along was a mid tempo rockabilly not dissimilar to Brenda Lee's Bigelow ??. The b-side was even better, with Boots Randolph's sax driving the rocker along with the Anita Kerr Singers adding to the wonderful sound. Quite why this was never a hit I'm not sure, and why it is never issued on any compilations is even more baffling. The second session on 26th June that year spawned the follow-up single, Trail of the Lonesome Pine and South of the Border. Both songs showed an unusual blend of the Tennessee style rock 'n' roll and the swamp pop that was a part of Donley's soul. The third single featured a song from each of the preceding two sessions, with I Gotta Go and Baby How Long. The top side was a Fats Domino style stroller with plenty of high pitched wails of anxiety. The flip was mid tempo rocker again in the Fats mould, complete with the high pitched "la la's". It failed to make any noise but Decca were still confident that Donley was an artist to persevere with. It's intriguing to wonder what Donley himself must have been thinking at the time, especially on his bad days when steam of frustration must have been coming out of his ears. On 21st November 1957 Donley was reacquainted at Owen Bradley's Studio with Boots Randolph and the Anita Kerr singers, and the wonderful Hank Garland on guitar. The single taken from the session shows Garland on fine form on the rockabilly number Please (Baby) Come Home. Sadly the b-side has become Donley's epitaph, Born To Be A Loser. Credit here must go to the versatility of the A-team who provide a backing that belies the Nashville setting, sounding for all the world like it was cut in Crowley, Loiusiana. By now his life outside the studio was a mess, with spells of depression causing moments of violence which often resulted in periods in the slammer. A good place for writing songs but not great for someone with his mental problems who obviously needed a lot of TLC. How the fifth single wasn't a hit I'll never know. Radio, Jukebox and TV is a swamp pop/rock 'n' roll classic and the b-side, I'm Alone is a heartfelt ballad with pure lonesome vocals beautifully complimented the Anita Kerr and the gals. And if that was a good single, the follow-up was even better, one of the greatest double-sided non-hits of all time. The Shape You Left Me In is his best rocker, with it's full sound, it was as if everyone of the session pickers gave him everything they had because even they couldn't believe he wasn't get hit records. It's perfect rock 'n' roll for 1959, something akin to the sound of Jack Scott's best work. And if ever a single was called something that reflected the artists situation, this was it - What Must I Do. It was a brilliant ballad, beautifully sung. Between the two sides it was a fabulous 45, with a great uptempo side and a beautiful slow side. The second single of 1959, the glorious ballad Now I Know again failed to chart and the voices in Jimmy's head must have been tormenting him as he saw Brenda Lee copy the song as Weep No More My Baby. The flip was a swamp popper with JD giving another stellar performance. They could take the boy to Nashville but they couldn't take the Cajun out of him. 1959 had been a curious year for Donley. In spite of two brilliant singles he'd still failed to garner any chart action, but his love life took a turn for the better when he married Lillie Mae Urgas on January 30th. She was better equipped than the previous wives to deal with Donley's violent fits, and suffered more than she should. She frequently left for short spells, giving JD great inspiration for his songwriting, with classics like Think It Over, Please Mr Sandman and Forever Lillie Mae resulting from these periods of despair. In such a cut throat world as the music business it was no surprise when Decca finally ran out of patience. His last song for the label was a last ditch attempt to appeal to the soppy teens of the day who'd given up buying guitar led rock 'n' roll for string laden ballads. Despite this attempt, Our Love and My Baby's Gone again failed to register. The top side (cut on 14th April 1960) was a gentle ballad with the flip being the type of orchestrated rock 'n' roll Roy Orbison was starting to make popular. The change in style was an obvious move, but surely they'd have been better served by just changing his name to Bobby! 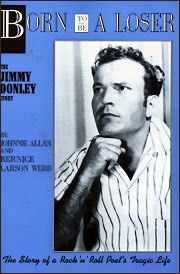 Disillusioned and impatient, Donley began selling his songs for a pittance. One he happened to keep was What A Price, which Fats Domino picked up in the summer of '61, and took into the top 30. Fats was to record another half dozen Donley songs, the royalties giving Jimmy one of the few things of stability in his life. Another of those, his mother died suddenly on March 15th 1962, a great loss which JD never really recovered from. Legend has it that he spent long hours at her unmarked grave, playing his guitar through the lonely night whilst drinking a bottle of whiskey. A chance meeting at Cosimo Matassa's studio in New Orleans led to Donley signing up with producer Heuy Meaux, who remembered Donley as "the most lonesome guy on earth. Reminded me so much of the late Hank Williams. He wrote songs and sang them in a Heartbreak Key. At times he could write as many as eight songs a day. You could give him an idea and Boom! He had you a song that could be recorded in any style". 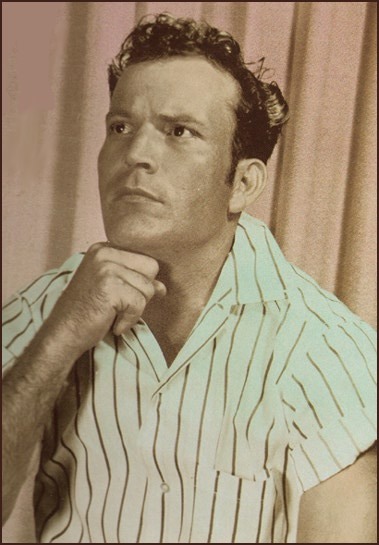 Meaux issued no fewer than 9 Donley singles over the next few years on his Tear Drop label which also saw released by Rod Bernard and Gene Summers. Non of the singles made the charts but they were again excellent songs, mostly in the swamp pop style that Donley was able to capture better than anyone. A year and five days after the death of his mother, Jimmy Donley took his own life, an almost welcome release for a troubled but brilliant man. Forty years on, the name lives on through the jukeboxes of south east Texas and Louisiana. The Decca stuff was issued on a fabulous Charley vinyl album in 1987 but for some inexplicable reason has yet to see the light of day on CD. The Tear Drop sides were issued on an Edsel/Crazy Cajun CD in 1999. Fan and fellow swamp pop legend Johnnie Allan wrote a book about Donley's life with Dr Bernice Webb and for years there has been the rumour that Hollywood is going to film a biopic.